1DegreeCreative – Page 2 – All it takes is one degree. I am crazy pumped about this. I’ve been waiting for new M83 material about as much as I was looking forward to new Bon Iver material. So here is the first single from M83’s new album. Details have just emerged about the name and release date. It’s gonna be called “Hurry Up, We’re Dreaming”, and is planned to be released October 18th. You can download your very own copy here. Over the course of an EP and two albums, Glasgow’s Sons and Daughters wedded punk’s charged menace to a much older macabre spirit lurking in the musty back pages of folk, pop, and rockabilly. It’s a neatly evocative trick, but one that gloomy post-punk icons like X, the Mekons, and the Birthday Party already pulled off in the late 1970s and early 80s. Another quarter-century removed from greasers, torch singers, and murder balladeers, Sons and Daughters’ resurrections had a tendency to feel like kitsch, but really fun kitsch. Their antiquated influences eliminated the need for reverence, so the band could concentrate on cranking out absurdly enjoyable slices of breakneck nastiness. 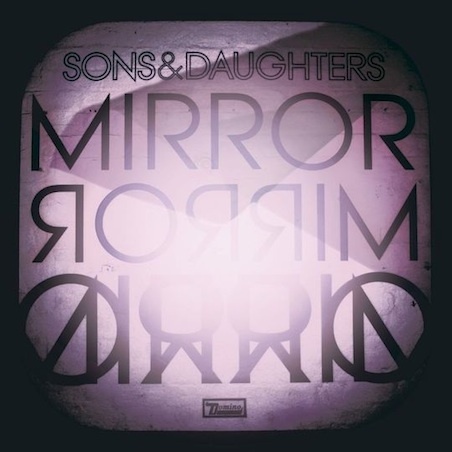 Sons and Daughters’ third full-length, Mirror Mirror, mostly trades one brand of pillaging for a duller one. The moroseness and death obsession remain (one song’s about the Black Dahlia), but instead of using dark concerns as a springboard for sick thrills, Sons and Daughters have gotten hung up on the precise craft of emulating gothic post-punks like Siouxsie and the Banshees, Joy Division, and Bauhaus. Mirror Mirror is impressively spot-on in its reenactments, from doomy synths and cavernous drums to guitars that are practically always whirring, grinding, or shooting out lonely shards and tendrils; in fact, much of the album’s merit is textural. But that’s a dispiriting realization considering how great Sons and Daughters have previously been at crafting arresting, immediate hooks. And what happened to the tempos? Even the band’s most ardent supporters would concede their previous albums were a tad relentless in their barreling pace, but too much of Mirror Mirror is either plodding or static. Only a few times, most notably on “Breaking Fun” and “Rose Red”, do Sons and Daughters really get pulses pounding. All this atmosphere and portent would be fine if the band displayed the presence to sell it. Instead, engrossing lead singer Adele Bethel cedes too much of the mic to counterpart Scott Paterson, who has been effective in call-and-response settings but isn’t distinctive enough to carry songs himself. No matter who’s taking the lead, neither singer seems to be having much fun, which used to be a constant for Sons and Daughters regardless of how bleak or blood-soaked their lyrical fixations might have been. Mirror Mirror smacks of a band struggling to be taken more seriously, but simply settling on a more stone-faced form of pastiche isn’t the way to do it. All they’ve really done is trade a Halloween party for a history lesson. Wear a hood with one eyehole. Periodically make strange gurgling noises. After confirming everyone’s names on the roll, thank the class for attending “Advanced Astrodynamics 690” and mention that yesterday was the last day to drop. Deliver your lecture through a hand puppet. If a student asks you a question directly, say in a high-pitched voice, “The Professor can’t hear you, you’ll have to ask *me*, Winky Willy”. Pick out random students, ask them questions, and time their responses with a stop watch. Record their times in your grade book while muttering “tsk, tsk”. Ask students to call you “Tinkerbell” or “Surfin’ Bird”. Play “Kumbaya” on the banjo. Ask occassional questions, but mutter “as if you gibbering simps would know” and move on before anyone can answer. Point the overhead projector at the class. Demand each student’s name, rank, and serial number. Begin class by smashing the neck off a bottle of vodka, and announce that the lecture’s over when the bottle’s done. Wear a “virtual reality” helmet and strange gloves. When someone asks a question, turn in their direction and make throttling motions with your hands. Growl constantly and address students as “matey”. Devote your math lecture to free verse about your favorite numbers and ask students to “sit back and groove”. Announce that last year’s students have almost finished their class projects. Wear a feather boa and ask students to call you “Snuggles”. Tell your math students that they must do all their work in a base 11 number system. Use a complicated symbol you’ve named after yourself in place of the number 10 and threaten to fail students who don’t use it. Have a grad student in a black beret pluck at a bass while you lecture. Give an opening monologue. Take two minute “commercial breaks” every ten minutes. Tell students that you’ll fail them if they cheat on exams or “fake the funk”. Pass out dental floss to students and devote the lecture to oral hygiene. Announce that the entire 32-volume Encyclopedia Britannica will be required reading for your class. Assign a report on Volume 1, Aardvark through Armenia, for next class. Ask students to list their favorite showtunes on a signup sheet. Criticize their choices and make notes in your grade book. Warn students that they should bring a sack lunch to exams. Show up to lecture in a ventilated clean suit. Advise students to keep their distance for their own safety and mutter something about “that bug I picked up in the field”. From: The Science & Technology Wing of University of Pennsylvania.